Fly a helicopter around circle. The helicopter is attached to a rod that pivots on top of a center pylon and a counter weight helps lift the helicopter. 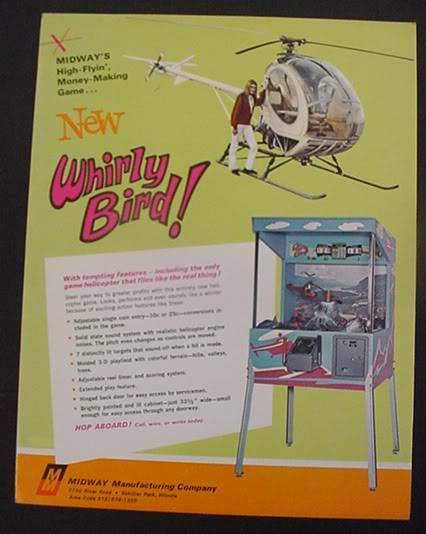 Player controls the helicopter's pitch and speed (Helicopter Trainer, Whirly Bird, Sega's Helicopter, and Chopper all used a similar helicopter, motor and pitch control mechanism). The object of the game is to fly the helicopter so it touch one of seven stationary pins (located around the edges of the helicopter's circle of rotation) with the helicopter's two pring "whiskers". The stationary pin to touch is identified by a light. After touching one stationary pin, another stationary pin is lit. Whirlybird's two spring Whiskers on the helicopter passed a small current through the stationary pin and the helicopter. When the correct pin is hit, points are scored. There is a set amount of time per game. The more targets hit, the higher the score. Size is 33.5" across the front, 34" deep, meaning it's rather large to get through any door less than 36"!